NC Business Hall of Fame -- Charles F. Myers Jr.
A successful textile and banking executive, Charles F. Myers Jr. led Burlington Industries into a world leadership role in the textile industry during the 1950s-1970s. Junior Achievement Born in Charleston, West Virginia, Charles Myers grew up in Greensboro. He graduated from Davidson College and the Harvard University Graduate School of Business Administration. Joining the Bank of New York, he served there from 1925-1939 when he joined Wachovia Bank and Trust Company, rising to the role of vice president. He joined the U.S. Navy during World War II and reached the rank of lieutenant commander. In 1947, Spencer Love convinced Myers to become the head of Burlington Industries' Financial Services Department. In 1953, Myers was elected treasurer and a board member in 1955. In 1961, he assumed the role as Executive Vice President. 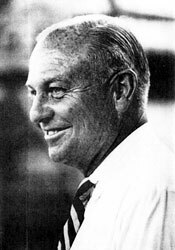 When Love died in January 1962, Myers was selected as president and chief executive officer and then chairman in February 1968. During Myers' first six years heading the company, Burlington Industries grew from $37.5 million to $79 million in net earnings, while annual sales rose from $1 billion to $1.6 billion. He served as president of the American Textgile Manufacturers Institute. Charles Mayers was married to Rebecca Wright and the couple had four daughters.